Poachers killed at least 30 elephants in southwestern Chad during the early hours of Tuesday, July 24. During the night, Stephanie Vergniault, president of the organization SOS Elephants, described on her Facebook page how a group of armed horsemen chased a herd of elephants with “war weapons near the SOS Elephants camp in the Chari Baguirmi area. After daybreak, the SOS Elephants team counted 28 carcasses, most with missing tusks. The exact number of carcasses with missing tusks is unclear because the team was afraid to stay and investigate further due to the presence of the poachers hiding on the other side of the Chari River. The elephant massacre occurred as 350 participants from all over the world attend the 62nd meeting of the Convention on International Trade in Endangered Species of Wild Fauna and Flora (CITES) Standing Committee in Geneva, Switzerland, where the illegal killing of elephants and ivory smuggling are at the top of the agenda. On Tuesday, the Standing Committee discussed the close correspondence between rising trends in elephant poaching and large-scale ivory seizures and recommendations to improve the situation. It also considered a new report, titled "Decision-Making Mechanisms and Necessary Conditions for a Future Trade in African Elephant Ivory," that explores the future legalization of international ivory trade and the potential establishment of a Central Ivory Selling Organization (similar to the DeBeers diamond cartel). Local communities and the SOS Elephants team living permanently at the camp, including SOS Elephants’ Secretary General Raphael Djimadibaye, who heard the attack informed the Paramount Chief. The Chief contacted Vergniault, who spoke with local authorities, and in turn immediately sent soldiers to track the poachers. The day following the attack, the SOS Elephants team found a baby elephant in the area, whose mother had likely been killed in the incident. The SOS Elephants team rescued the orphaned elephant, carrying the three-week-old male, now nicknamed “Toto”, to camp and giving him milk formula. Vergniault suspects the massacre was carried out by Chadians who are part of a local “ivory mafia” that is “backed by some officials” and makes “dirty deals with the Chinese labor” at the oil refinery. The refinery is a joint venture between the China National Petroleum Corporation (CNPC), who owns 60 percent, and the Chad government (the state firm Société des Hydrocarbures du Tchad, SHT). The plant, which is designed to process crude oil from wells in the Southern Bongor region through a 311 kilometer pipeline, opened in June 2011 with initial production of 20,000 barrels-per-day (bpd). That production is expected to increase to 60,000 bpd, with output intended for local consumption in Chad and the sub-region. According to the International Fund for Animal Welfare, Chad’s elephant population has plummeted from 4,000 individuals in 2006 to about 2,500 in 2010, the year of the most recent census. Given on-going high levels of poaching that number has likely declined still further. 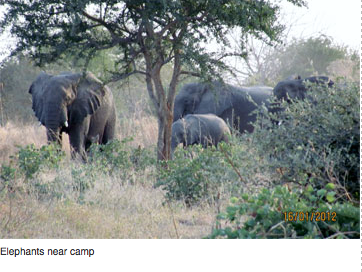 In Zakouma National Park, elephant numbers dropped from 3,000 elephants in 2006 to 940 in 2008 and 450 today. Vergniault estimates that about 1,500 elephants remain in Chad, with 450 in Zakouma, 300 in the (unprotected) Chari Baguirmi-Mayo Lemie area, and 700 spread around the country. If poaching continues at this rate, Vergniault says, “not a single elephant will be alive in Chad in three years time.” She is calling for the establishment of permanent anti-poaching units and also for stronger penalties for those caught poaching. 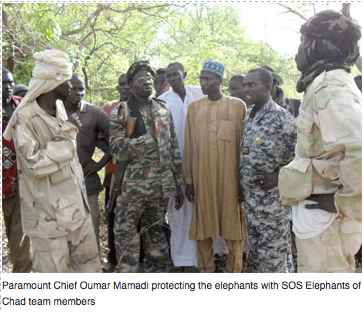 SOS Elephants is the only non-government organization in Chad dedicated to preserving elephants and their habitats. It works through a combination of research, education, conservation and counter-poaching actions. The organization has developed a network of 100 to 200 local people who inform about poaching activities, including providing positions of poachers or elephants. 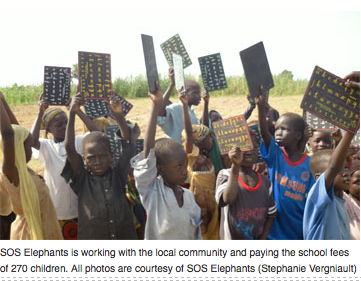 It recently opened SOS Elephants in Congo. View this article on mongabay.com.